Can a pdf be added to the Newsletter Stories? Discussion in 'General' started by Kathy Schmidt on Nov 5, 2018. Certainly you can add files into your bulletin, including PDFs. 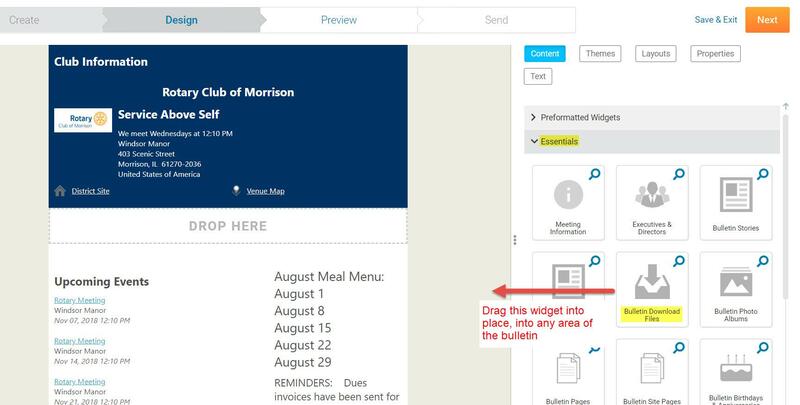 Some Clubs design their entire bulletin in MS Word or some other program, export to PDF, then simply attach that PDF bulletin inside a ClubRunner bulletin (this lets them use their bulletin program of choice, while still utilizing ClubRunner's email and bulletin stats & archiving system). This works well because you are not attaching the actual file (let's say it's 8 MB in size for example), instead you are attaching a link to that file which is stored on our server. This means your emailed bulletin remains small, instead of being 8+ MB large. When the user clicks on the file, they download that file (PDF etc.) off our server onto their device. Inside your Club website, in the Bulletins section, I have also created an example bulletin for you called "Bulletin Download File Example". If you have further questions don't hesitate to post again. if I can upload a pdf within a clubrunner template using one of the widgets. So far I have had no success.